Every girl at some point in her life deserves to have a party. So why not make everyday a little more special with this easy to craft DIY Birthday Cake Lip Balm! It's fun to make and it can be completed from start to finish in under an hour! These little handcrafted lip balm pots are great for party and wedding favors, birthday gifts, and even stocking stuffers for the upcoming holiday season. But be sure to treat yourself to one or two as well and make yourself - and your lips - shine! in order to offer you everything you could want in a tinted lip balm! Moisture, fragrance and just a hint of shimmering color. So don't go into winter unprepared! Whip up this lip balm for you and your friends to prevent and treat chapped, dry lips while making them look their very best! Weigh out your butters using a digital scale and combine in a small glass bowl or measuring cup. Then measure out two level Tablespoons of white beeswax pellets or grated beeswax and add to the butters. Melt the butters and beeswax in a double boiler or in your microwave on reduced power until thoroughly melted. Stir well. Now measure out 5mL of Buttercream Cupcake flavor oil using a graduated plastic pipette and stir into your lip balm mixture. Take a pinch each of lip safe Diamond Dust mica and a pinch of pink ultramarine pigment powder and add to your lip balm. Use more or less depending on the amount of color and shimmer desired. Stir well to ensure all ingredients are thoroughly incorporated. Now, using a plastic pipette, fill your choice of lip balm pots with the melted lip balm mixture. I used seven 1/3oz. lip balm pots for this recipe each with approximately 2oz. by weight of lip balm. If your lip balm solidifies while you're filling your containers, simply reheat the lip balm and continue until all the pots are filled. Tightly screw on the lip balm caps and wait for the lip balms to solidify. It won't take long, but you can expedite the process by placing the lip balms in the refrigerator until they have hardened. 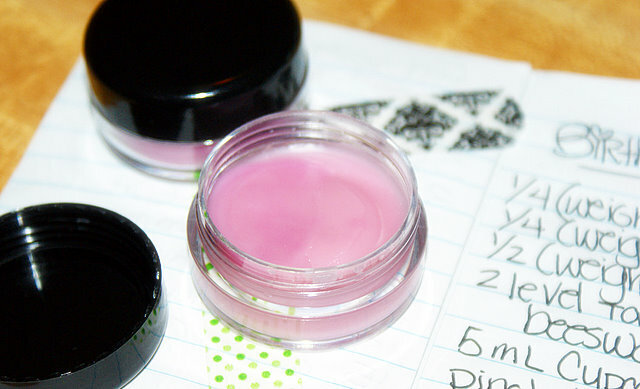 Once your lip balms have hardened, have fun with the containers! I decorated mine with Japanese Washi Tape. 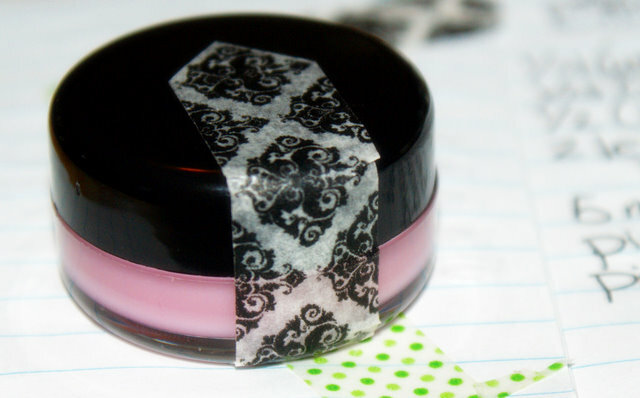 It makes for a super cute lip balm pot without a lot of effort. I'm a little smitten with some of the Washi Tapes available from Cute Tape. Need ingredients for this project? You can find them at Nature's Garden Candles. If you're looking for certified organic ingredients, then I recommend Mountain Rose Herbs. Cake not quite your style? Then check out some of my other DIY Lip Balm Recipes: Mango Shimmer Tinted Lip Balm, Natural Lavender Mint Vegan Lip Balm, and Homemade Chocolate Mint Lip Balm. Looks wonderful! - & I love the tape also! Thanks for dropping by, Angie. Hey, that's not a food recipe! :) Ana, I must confess, I am joining you in the hopes of getting Rebecca to write another post on chocolate mint lip balms. But then again, I guess even if we make one, it would finish too quickly! Thanks for stopping by, Heather. Yes indeed, not only considering the color but also the eco-friendliness of the recipe. Where do you buy the supplies though? Reading Rebecca's post, I can see that she recommends two places to buy the ingredients: Nature's Garden Candles and Mountain Rose Herbs If you're looking for certified organic ingredients. Looks pretty easy, but I don't think I will try it. Bet my teen grands would! Why not try it yourself? I bet it is fun and easy! I'm so glad you all like this recipe. It was a lot of fun to make, but still easy enough for a beginner or as a family project. You can do a ton of variations with this recipe as far as scenting with essential oils rather than flavor oils - like using tangerine or grapefruit eo, or peppermint or wintergreen! You can also put this recipe into lip balm tubes. I like to fill a small container with epsom salts to hold my lip balm tubes so they don't tip! And yes, I plan to share more recipes here in the future! This looks so great Sonya! I think I might have to make this with my 6yo. What fun! I bet that smells as wonderful as it will look on. Thanks for sharing the recipe. thanks a lot for the recipe, I will try it asap!